A deciduous shrub that reaches heights and spreads of between 12 and 20 feet, the pomegranate (Punica granatum) features multiple, thick stems covered with reddish-brown bark that turn gray as the tree matures. Ideal for U.S. Department of Agriculture plant hardiness zones 7 through 10, some species of pomegranate can live for more than 200 years, according to the California Rare Fruit Growers. Provide your pomegranate plant with enough water, sunlight and fertilizer to ensure it thrives. Plant your pomegranate seedling in soil with a pH of between 5.5 to 7.0 and full sunlight to partial shade. Loosely work the soil before planting the pomegranate 6 to 9 feet apart if creating a hedge. In an orchard setting, a space of 15 to 18 feet is adequate. Irrigate your pomegranate tree every seven to 10 days. On average, the tree requires 50 to 60 inches of water per year. For instance, provide the tree with a 5- to 6-inch drink of water every 10 days. Hold off on your regular irrigation schedule if Mother Nature is adequately irrigating your pomegranate trees. Check that the soil around your pomegranate is evenly moist during late summer to early fall to help prevent fruit splitting. 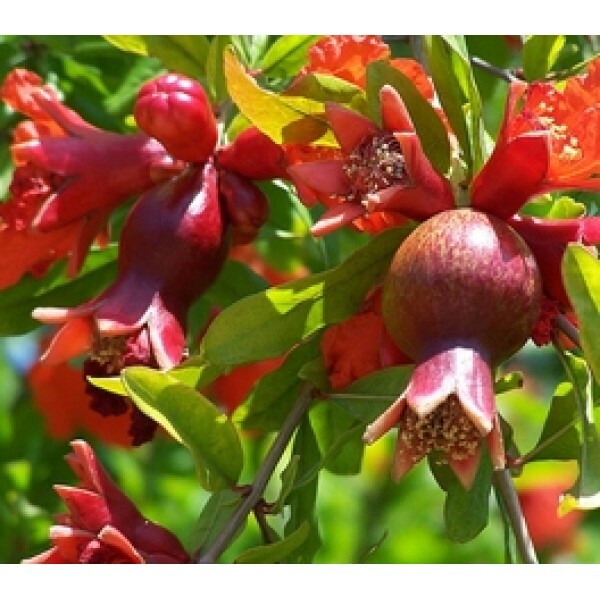 Provide your young pomegranate tree with 2 to 2 1/2 pounds of 8-8-8 fertilizer in March and November. According to the California Rare Fruit Growers, as the pomegranate tree matures, it’s best to switch from fertilizer to an annual soil amendment of compost or rotted manure. Cut away all but the healthiest four to five shoots on your pomegranate tree once it reaches a height of 2 feet. Since new fruit production occurs at the tip, the California Rare Fruit Growers recommends shortening the shoots every year for the first three years to encourage new growth and create a strong, sturdy plant. After the first three years, the occasional removal of dead branches is the tree’s only pruning requirement. Monitor your pomegranate tree for signs of pests such as aphids. The University of California – Davis recommends controlling aphids biologically by introducing lady beetles (Coccinellidae). The application of the pesticide Lannate was tested, but UC – Davis cautions this chemical can disrupt the application of pesticides to control other pests, including mealy bugs. Harvest the pomegranate fruit when it achieves a size of between 2 to 5 inches and turns purplish-red or brownish-yellow in color. Tap on the fruit and listening for a metallic sound as a sign it’s ready for harvest.